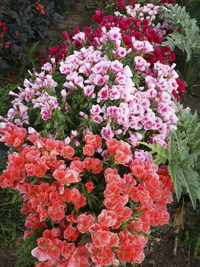 Godetia is the old genus name for what is now universally known as Clarkia, named for Captain William Clark (of the Lewis and Clark Expedition), probably one of the first Europeans to see and make note of it. All species of Clarkia are native to the American west, the showiest ones in California and Oregon west of the Cascades. Close relatives of evening primrose, not far removed from poppies. 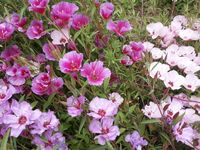 I've always thought Oregon should plant Clarkia amoena as a native roadside wildflower. There are many species and subspecies.